The capacitive sensor system capaNCDT 6200 system provides a modular, compact, expandable and cost effective measurement system that is suitable for R&D, test, OEM and production environments, where either flexibility to expand the measurement system and/or high precision measurement is key. The capaNCDT 6200 controller (oscillator) base unit can be expanded at any time to include up to four measurement channels. All capacitive displacement sensors from Micro-Epsilon can be connected to the capaNCDT 6200 with no further calibration required. The capaNCDT 6200 can be expanded by simply adding a DL6220 demodulator, which provides an Ethernet interface, supporting fast and easy configuration through a web browser. No additional software has to be installed. With easy integration into the existing network, the Ethernet interface also maximises the accuracy of the measurement readings, as there is no signal ‘noise’ or loss in the signal compared to analogue outputs, resulting in true nanometre resolutions. 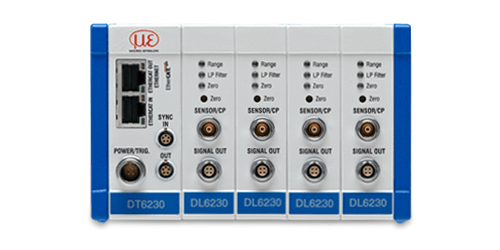 Based on the same modular design principle, the new DL6230 demodulator can now also be added to the capaNCDT 6200 controller and/or DL6220 demodulator as an expansion module. 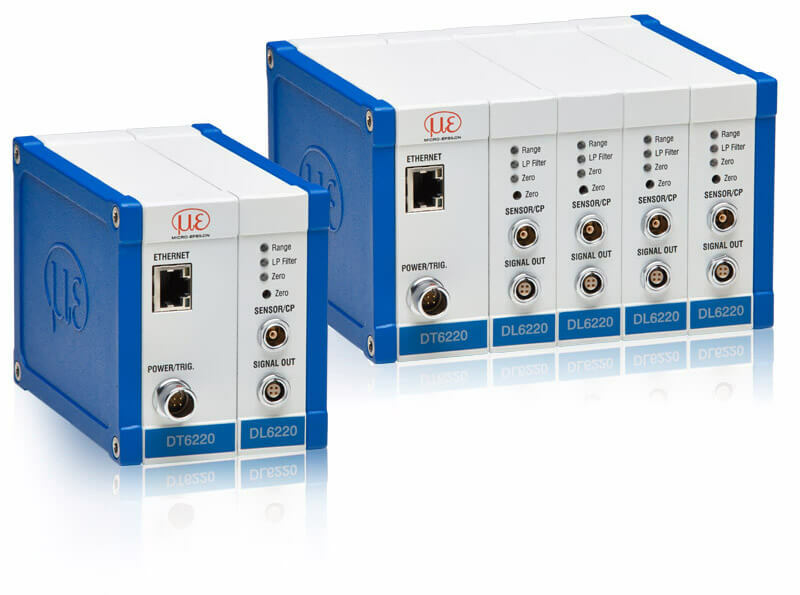 As well as an Ethernet interface, the DL6230 also provides an EtherCAT interface and also synchronises multiple banks of controllers/demodulators. The capacitive DL6220 demodulator is used for numerous capacitive measurement tasks offering high resolution and signal stability. As well as analogue outputs, the demodulator is equipped with, depending on the controller variant, an Ethernet or Ethernet/EtherCAT digital interface. The DL6220 demodulator is compatible with all sensors and cables of the capaNCDT series. The capacitive DL6230 demodulator is used for high resolution measurement tasks and can be applied in synchronous operation. As well as analogue outputs, the demodulator is also equipped with, depending on the controller variant, an Ethernet or Ethernet/EtherCAT digital interface. 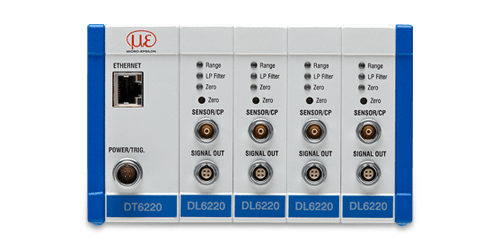 The DL6230 demodulator is compatible with all sensors and cables of the capaNCDT series. The DT6222 capacitive controller is used for dynamic, capacitive measurement tasks. 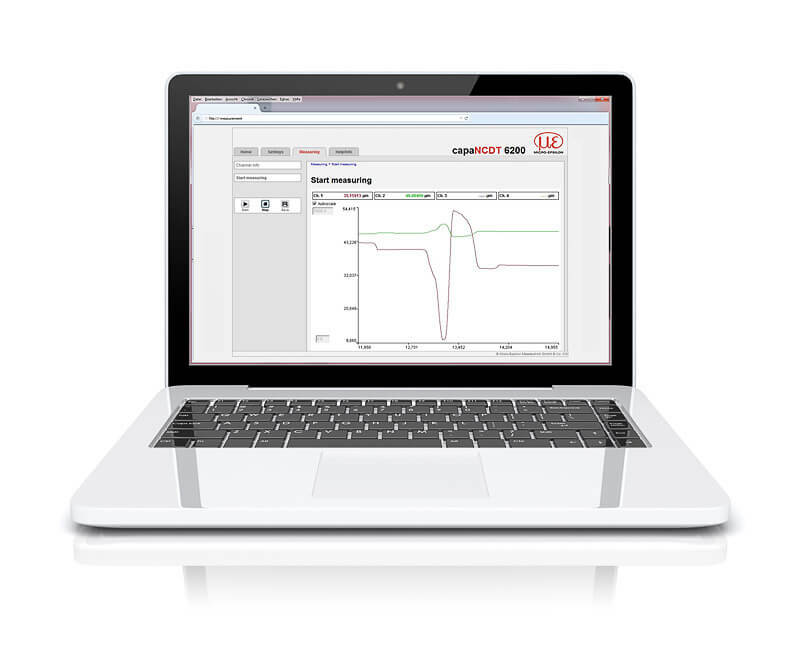 A frequency response of up to 20kHz (-3dB) enables reliable monitoring of fast processes. As well as analogue outputs, the controller is also equipped with a digital Ethernet interface. The DT6222 controller is compatible with all sensors and cables of the capaNCDT series.